The bank’s heritage dates its origins back to 1882 when founder James H. King opened his privately owned bank in Stillman Valley. The original structure was a 20-foot wide single-story frame building on the corner of what’s now Walnut and Main Street in Stillman Valley, directly across from the bank’s current Stillman Valley facility. The name became King and Wilbur, Bankers in 1884 and King, Wilbur & Co. in 1886 as additional associates joined the firm. 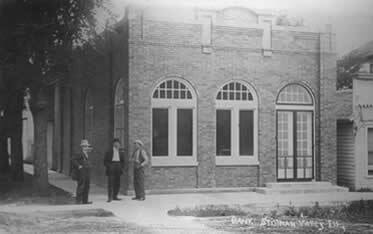 In 1914, the bank was incorporated under the State of Illinois banking law and in the same year it was named Stillman Valley Bank. On January 2, 1937, it became a national bank and acquired the name it would have for the next 57 years, The Stillman Valley National Bank. It endured the depression without closing or loss to anyone, a notable achievement in those times. The original frame building was replaced by a brick facility in 1911 and was occupied by the bank until 1963 when a new facility was built across the street. This facility was extensively remodeled in 1974 and again in 1984. Wanting to place itself even closer to its growing number of customers throughout Ogle County, the bank established a facility in Oregon in 1982 to serve the Oregon/Mt. Morris/Dixon/Grand Detour area. In 1987, it acquired the former United Bank of Rochelle; and in July, 1993, another full service facility was opened in Byron. To reflect the bank’s evolution to multi-community service, as well as its growing array of financial services—including a trust department which was added in 1994—the bank changed its name to Stillman BancCorp N.A. in September of that year. The bank’s first office outside of Ogle County was opened on July 15, 1999, on East State Street in Rockford. The bank’s sixth office, in Roscoe/Rockton, opened in 2006. The continual growth of the bank is reflected not only in its facilities, but also in its financial statements. In 1944, assets were $1.5 million. Twenty-five years later, in 1969, assets were $11 million. By December 31, 1999, assets had reached $210 million. Today assets are over $400 million and continue to grow. A local community bank, Stillman BancCorp N.A., now known simply as Stillman Bank, has remained independently owned since its inception in 1882. The bank is one of only a few banks in the Rockford area that still remains locally headquartered.